Unibet was founded in 1997 and still lives after the motto “By players for players”. They do everything with the player in focus and do not waste your time with any Unibet bonus or services that you do not get seriously from. Unibet has won many awards for both their platform and user experience, but also when it comes to preventive work for responsible gaming. As a customer at Unibet, you feel like part of a big community. They have created a pleasant gaming environment with many recurring bonuses, making it easy for customers to be a repeat customer. Unibet has free live stream. They call it Unibet TV and is located at the top right of the page. Here you can choose and wreck among European, American, Brazilian and Australian top football. Even great golf and tennis tournaments as well as NBA basketball and NHL hockey live streams. Even UFC events have previously been shown via the live stream on Unibet TV. Please note that you must have funds in your account to access the live stream. Due to individual broadcasting rights, the supply of live streaming is different from country to country and can be changed on a regular basis. 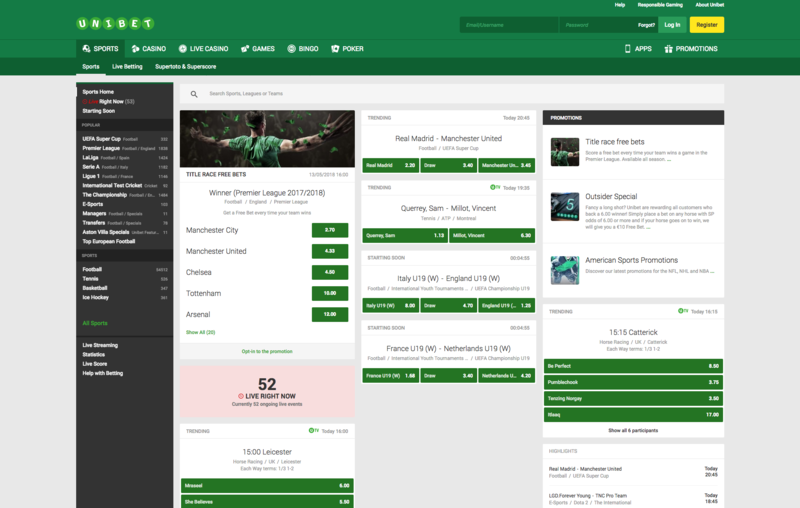 Unibet In-play betting has improved and improved in recent years. They offer a wide selection of events and there is a wide variety of gaming options. Half Time Results, Next Team To Score, Double Chance, Over/Under Goal, Match Score, Number of Cards, Both Teams to Score, Asian Handicap and European Handicap are examples of live bets you can play. You can follow the result via a scoreboard showing both statistics and results. Some selected events can also be seen live with Unibet TV right on your desktop. Unibets also offers a Cash Out feature that gives you the opportunity to redeem a current bet before the outcome is determined so that you can secure a portion of your winnings or reduce your losses.